Last year, we published The Recruiter Life survey and asked you to dig deep into your life as a recruiter. After carefully combing through the data, we’ve compiled a special report to show you what your peers are doing and how you stack up. 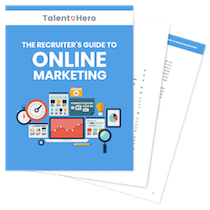 If you’re a regular reader of Talent Hero blog, you’ll notice that I often tell recruiters that there is a vast opportunity to grow your business online if you’re willing to dedicate the proper amount of time and money to the task. This chart shows that some of you are listening. In fact, 35% of recruiters’ new business is coming through online channels including email, social media, search and online advertising. However, if you’re one of the people who is exclusively using an old school method like cold calling or relying heavily on your network to produce more business, now is the time to branch out and grow. 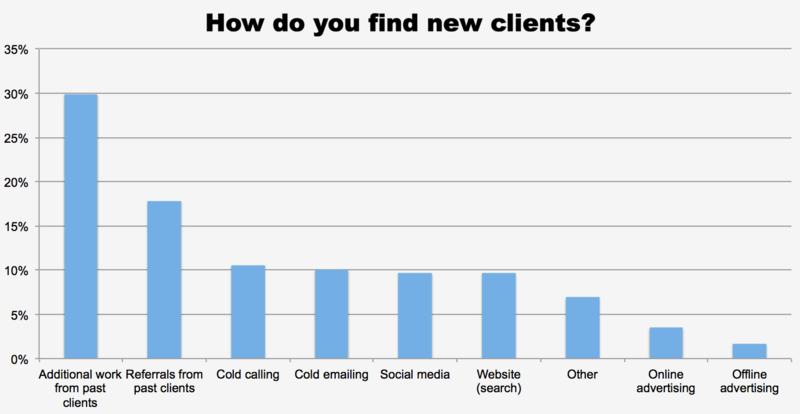 Recruiters cannot agree on the most difficult aspect of finding new clients. Whether it is competition from other recruiters, finding contact information for the decision-makers or getting those same decision-makers to reply to your initial outreach, there are clearly many challenges facing recruiters when they are looking for open jobs to fill. Even experienced recruiters tend to run into roadblocks. One recruiter with more than 10 years on the job noted that their biggest difficulty was “helping clients overcome their decision-making paralysis when they see candidates who have transferrable skills that are not an obvious match for their requirements”. Another noted a similar problem and commented that it can be difficult to “influence decision makers to take calculated risks on hiring someone without multiple years of experience in their industry even though significant results can be demonstrated through quick learning”. When asked how recruiters source new candidates, it was unsurprising to see LinkedIn dominate the rankings, with over 50% of candidates sourced through either the free version of LinkedIn or LinkedIn Recruiter. However, note that social media is starting to chip away at LinkedIn’s lead. Almost 15% of new candidates were sourced through either Facebook or Twitter, an impressive number given that neither are known as sourcing platforms. In addition, it is worth mentioning that among write-in candidates for sourcing tools, Hiretual absolutely dominated the competition (not shown in the chart). It may be worth checking out their platform to see why people love it so much. For those who struggle with this problem, stay tuned for an upcoming article where we explore how you can stand out from the crowd. When we asked you for the apps and subscription services you use on a daily basis, you responded loud and clear. Contact finding apps such as Hiretual, Lusha, Snovio and ContactOut top the list of tools that are regularly used. Given the specific challenges that recruiters face when sourcing candidates, this should come as no surprise. However, in spite of their popularity, many recruiters still struggled with using these tools effectively. Multiple recruiters noted their frustration with the tools’ accuracy rate and others wished for better integration with their existing ATS or recruitment marketing platform. When we asked you for tools you wish existed that could make your job easier, your list of answers was long and varied. Some wanted to simply improve on their existing software, asking for “an ATS that actually works the way recruiters work” and “an ATS with better user workflow”. Others focused their attention on improving the interview and hiring process specifically, requesting “a way to keep track of which recruiter interviewed which candidate, their status within the company after being hired and if they quit immediately after training” and “a unified platform to screen, interview and test candidates, including mobile access”. Still others focused on automating the recruiting process, talking about “a candidate sourcing system that allows for the input of a candidate profile, position profile, and company profile. The system then utilizes matching talent sources, assesses talent strengths, HR analytics, identifies the “best-in-the-business” talent, and delivers a “top 10 prospect list” to engage and recruit”, “a tool that would take a job description and break into metadata before plugging it into the various resume websites we use. It would create boolean searches, following each website’s particular style, and generate a list of leads automatically, cross-referencing them for most recent resumes on duplicate profiles” and “A service that could tell me the readiness of the candidate (using a scoring algorithm) to consider new propositions”. The biggest takeaway from the survey is simple – recruiting is not for the faint of heart. It’s a job that requires a diverse skillset to manage many moving parts. While there are certainly ways to systemize a process that simplifies your daily tasks, there is no way to get around the fact that in order to get paid, you must often convince a hiring manager, an HR specialist, a business owner and a candidate that working together is in their collective best interest. It’s a task that is easier said than done.